The Hi-Resolution S-Video with Audio to 3 RCA Adapter Cable. The Cable Connect your multimedia PC to your television with ease. This precision-engineered adapter cable connects the S-Video out of your computer to a TV, thus eliminating the need for several cables and/or adapters. 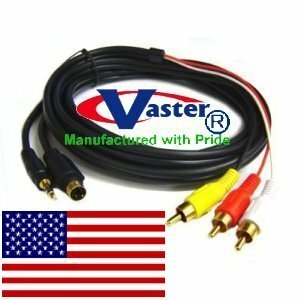 This bi-directional cable converts S-Video to composite RCA or vice-versa without an expensive active converter. The Cable Support High Quality 75ohm Coax Cable is Triple - Shielded with 85% Aluminum Foil and Braid to Reduce Unwanted Noise and Distortion. The Y/C Signal Separation Circuitry Provides a Bright, Crisp Picture From your PC. In Addition to Fitting Standard S-Video Jacks, the Cable Fits Both 4-pin Jacks on Desktops and Notebooks with a TV out Jack. Ordinary, "included in the box" S-video and Composite RCA Cables often use low-Quality Materials with Inferior Shielding that can result in poor sound and picture quality. If you have any questions about this product by VasterCable, contact us by completing and submitting the form below. If you are looking for a specif part number, please include it with your message.